Nocardiosis is typically regarded as an opportunistic infection in immunocompromised patients; however, approximately one-third of the infected patients are immunocompetent. Clinical diagnosis of pulmonary nocardiosis is difficult owing to the similarity of its presentation with other respiratory pathogens that include actinomycetes members and Mycobacterium tuberculosis (TB). Hence, the reported cases are few, and the literature is limited. Prognosis remains poor especially in immunocompromised patients and disseminated forms with central nervous system (CNS) involvement. We present case reports of two patients of pulmonary nocardiosis, one in renal transplant recipient and one more in immunocompetent patient. A 30-year-old male presented with history of productive cough, exertional dyspnea, fever with chill and rigors, loss of weight, and loss of appetite for 2 months. He had undergone renal transplantation with her sister as a live donor 8 years back for chronic kidney disease and was on immunosuppressive drugs, which he had discontinued 4 years back (except prednisolone) before the onset of his present complaints. He was a hypertensive on regular medication for the same. On examination, he was febrile; heart rate was 116 beats/min; respiratory rate was 27 breaths/min; blood pressure was 140/90 mmHg; and oxygen saturation was 91% while breathing room air. The patient had pallor and bilateral pedal edema. Systemic examination including respiratory system did not reveal any significant findings. The total leukocyte count was 8420/mm3 with 95% neutrophils and 3% lymphocytes. The hemoglobin was 9.2 g/dl, and the erythrocyte sedimentation rate was 106/h. Serum urea was 70 mg, and creatinine was 2.3 mg/dl. The patient also had hyperkalemia, hypoproteinemia, and hypoalbuminemia. On chest radiography, there were bilateral homogenous opacities [Figure 1]a. An empirical antibiotic, modified dose of piperacillin and tazobactam was started along with other supportive treatment. Nephrologist opinion was taken and restarted on mycophenolate, prednisolone, and tacrolimus. His sputum examination for tubercle bacilli, bacterial culture, and malignant cytology was inconclusive. Computed tomography (CT) of the thorax showed bilateral multiple pulmonary nodules and mass lesions [Figure 1]b. In view of his history, lymphoproliferative disorder/fungal infection was suspected. Bronchoalveolar lavage (BAL) revealed weak, acid-fast, and filamentous bacilli resembling Nocardia spp [Figure 1]c. He was started on a modified dose of trimethoprim/sulfamethoxazole (co-trimoxazole) and linezolid. Ensuring persistent improvement, the patient was discharged on the same drugs. He successfully completed 3 months of antibiotics with satisfactory clinicoradiological improvement. In view of his underlying diseased kidney and high relapse rate, the treatment is planned to continue for the total duration of 1 year. A 65-year-old female presented with complaints of cough, pleuritic chest pain, generalized weakness, loss of weight, and loss of appetite for 1 month. She was advised antitubercular treatment for her current condition. On examination, she was tachypneic with oxygen saturation of 90% on room air with bilateral crepitations scattered throughout both the lung fields. Hematological investigations revealed anemia (Hb-10.9 g/dl), leukocytosis (13,800/mm3) with neutrophilia (70%), and hyponatremia (Serum Na +-114 meq/l). Arterial blood gases showed type I respiratory failure. On chest radiograph, there was right-sided nonhomogenous opacity involving all zones and the left lung mid-zone infiltrates [Figure 2]a. An empirical antibiotic, cefoperazone plus sulbactam, was started along with other supportive treatment. The sputum examination both for tubercle bacilli and aerobic culture was negative. CT thorax showed heterogenous opacity in the right lung and left lower lobe [Figure 2]b. BAL revealed weak, acid-fast, filamentous bacilli resembling Nocardia spp. She was started on trimethoprim/sulfamethoxazole and linezolid. However, her general condition worsened and was intubated and connected to mechanical ventilator. Repeat chest radiography showed worsening of the lung lesions, and the patient expired due to cardiac arrest. Nocardia spp belong to the aerobic actinomycetes group of bacteria which are gram-positive bacilli showing branching filamentous forms, are nonspore forming, and mildly acid-fast bacteria. These bacteria are saprophytic and are found in soil and water. Human infection with Nocardia can result due to inhalation or contact with the bacteria through a cut or abraded skin. Previously, it was thought to be an uncommon infection. However, in a survey conducted by the Centre for Disease Control in 1976, it was estimated that as many as 500–1000 new cases per year occur in the US alone. Currently, in the recent years, the incidence of the disease is increasing mainly due to the increase in the number of immunocompromised individuals due to HIV infection, organ transplantation, and the patients receiving prolonged corticosteroids. Although unlikely, COPD has also been found as a predisposing factor for pulmonary nocardiosis. Two characteristics of nocardiosis are its ability to disseminate to virtually any organ, particularly the CNS, and its tendency to relapse or progress despite appropriate therapy. The lungs are the most commonly involved organ and account for 73%–77% of nocardiosis infection  and other organs involved being CNS, skin, and rarely cardiac, ocular, and osteoarticular. In 25%–50% of cases, hematogenous and/or lymphatic spread occurs resulting in disseminated disease. Mortality rates in immunocompromised patients with localized pleuropulmonary involvement range from 29% to 80%. In our case reports, both of them had isolated pulmonary involvement, the first patient being renal transplant recipient and the second one being immunocompetent. In majority of studies, nocardiosis patients developed the disease 4–24 weeks after the transplant procedure. This was attributed to the intensive immunosuppression given to the patients during this period. In our case report, the postrenal transplant patient who was only on steroids had developed the disease 8 years after the procedure. This emphasizes the fact that steroids, which have a profound inhibitory effect on granulocyte, lymphocyte, and monocyte activity predisposes the individuals for contracting rare bacterial infections irrespective of the phase of immunosuppression. The clinical presentation of pulmonary nocardiosis is usually nonspecific with subacute or chronic duration and similar to that of other bacterial, fungal infections. Cough, fever, malaise, and pleuritic pain are common complaints and are described in this case report. In countries where TB in endemic, most of the time symptoms are attributed TB, and the patients will be started on anti-TB drugs. Nocardiosis should always be excluded among such patients not responding to anti-TB treatment. The radiographic pattern is also nonspecific with varied presentation such as lobar or multilobar consolidation, solitary lung masses and/or nodules, and reticulonodular infiltrates. Cavitation can be seen in 30% of cases, and the upper lobes are more commonly involved. Both of our patients had mass-like lesions mimicking malignancy. Modified acid-fast staining using 1% sulfuric acid as a decolorizer was employed to identify Nocardia microscopically in clinical samples, where pink-colored filamentous branching bacilli are observed as shown in [Figure 1]. Isolation of the organism should be interpreted under the light of a relevant clinical background, as bacteria can also be isolated from colonized airways of apparently healthy individuals, such as bronchiectasis. In the present report, Nocardia was isolated from the BAL of both patients with suggestive symptoms. Species identification could not be done in our patients because of the lack of requisite infrastructure. Cotrimoxazole is still the drug of choice in the treatment of nocardial infection. Amikacin, imipenem, ceftriaxone, minocycline, levofloxacin, linezolid, and amoxicillin-clavulanic acid are the alternate drugs that have activity against Nocardia. A combination of two drugs has been used in our patients. Duration of the treatment is usually 6–12 months, depending on the severity of the disease. 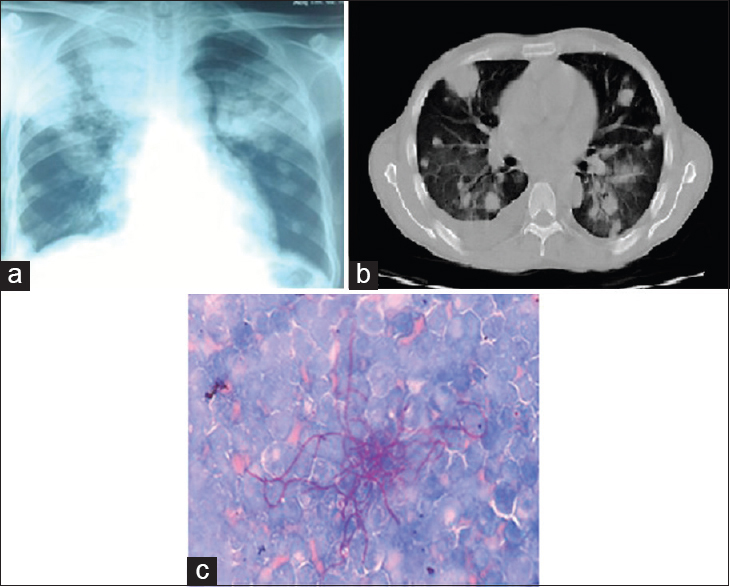 One should always consider pulmonary nocardiosis in the differential diagnosis of pneumonia and also in immunocompetent patients not responding to empirical treatment and when radiological features are atypical. Microbiological isolation is crucial for diagnosis; therefore, BAL should be considered in such patients. The morbidity and mortality caused by pulmonary nocardiosis can be reduced by early diagnosis and treatment. Minero MV, Marín M, Cercenado E, Rabadán PM, Bouza E, Muñoz P, et al. Nocardiosis at the turn of the century. Medicine (Baltimore) 2009;88:250-61. Kandi V. Human Nocardia infections: A Review of pulmonary nocardiosis. Cureus 2015;7:e304. Queipo-Zaragozá JA, Broseta-Rico E, Alapont-Alacreu JM, Santos-Durantez M, Sánchez-Plumed J, Jiménez-Cruz JF, et al. Nocardial infection in immunosuppressed kidney transplant recipients. Scand J Urol Nephrol 2004;38:168-73. Martínez Tomás R, Menéndez Villanueva R, Reyes Calzada S, Santos Durantez M, Vallés Tarazona JM, Modesto Alapont M, et al. Pulmonary nocardiosis: Risk factors and outcomes. Respirology 2007;12:394-400. Menéndez R, Cordero PJ, Santos M, Gobernado M, Marco V. Pulmonary infection with Nocardia species: A report of 10 cases and review. Eur Respir J 1997;10:1542-6. Beaman BL, Burnside J, Edwards B, Causey W. Nocardial infections in the United States, 1972-1974. J Infect Dis 1976;134:286-9. Pourmand G, Jazaeri SA, Mehrsai A, Kalhori S, Afshar K. Nocardiosis: Report of four cases in renal transplant recipients. Transplant Proc 1995;27:2731-3. Gutiérrez H, Salgado O, García R, Henríquez C, Herrera J, Rodríguez-Iturbe B, et al. Nocardiosis in renal transplant patients. Transplant Proc 1994;26:341-2. Mijares MC, Mendoza MT. Pulmonary nocardiosis in renal transplant recipients. Phil J Microbiol Infect Dis 2001:144-52. Yildiz O, Doganay M. Actinomycoses and Nocardia pulmonary infections. Curr Opin Pulm Med 2006;12:228-34. Tsujimoto N, Saraya T, Kikuchi K, Takata S, Kurihara Y, Hiraoka S, et al. High-resolution CT findings of patients with pulmonary nocardiosis. J Thorac Dis 2012;4:577-82. Brown-Elliott BA, Brown JM, Conville PS, Wallace RJ Jr. Clinical and laboratory features of the Nocardia spp. Based on current molecular taxonomy. Clin Microbiol Rev 2006;19:259-82.